Art Director: Hurryken Co., Inc.
A jazz pianist that scampers through the new century with his own methodology and techniques. Tanaka was born in Yokohama, and started to play an electronic organ at the age of four, and turned a classic pianist at the age of sixteen. After leaving the Faculty of Composition at the unitachi collage of Music, he studied jazz piano under Eiichi Fujii, Ichiko Hashimoto and Masahiko Sato. "ODD OR EVEN" by Nobumasa Tanaka KARTELL in 2000, solo piano "Mummy's Dance" in 2003, and "EDGE" by Nobumasa Tanaka KARTELL with Yoshiko Kanda released in 2006. He also worked with many other recordings. A multi-player that produces and does composition mainly in the field of contemporary music. Japan Philharmonic; also performed in the recital series "B→C" in 1998 sponsored by Tokyo Opera City. She appears in television and radio programs too. Kanda has premiered pieces of numerous composers including Toshi Ichiyanagi, Yoriaki Matsudaira, Yuji Takahashi, and Jo Kondo. She has also experienced many collaborative works with young composers. Recently, she has taken challenging approaches to the ossibility of percussions of old ages and different genres, i.e. Hokyo, Shosoin's restored instrument; joint work with original instruments, etc. Her compositions are played widely in and out of Japan, ncluding New York. Performs as a member of PERCUSSION TRIO [TheBirds], Ensemble contemporary α, etc. In 2002, Kanda released a CD titled "Salt & pepper" containing violin and percussion pieces, supported by Victor Entertainment. complicated and irregular meter, folk-like jazz... The play was electrifying enough to fill the established and old, dark and small club with resonance. It was, however, their world's first-class virtuoso and magnificent scale that made me feel as if I were in a world's great concert hall. I believed that they would fill any hall with sensation, even if it were Concertgebouw or Blue Note. flood. And then, both together, they step forward into rampage. 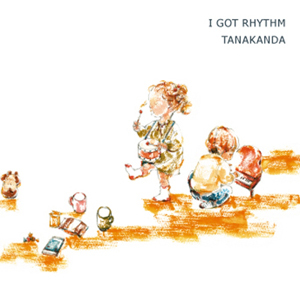 "I Got Rhythm": The dynamic arrangement blows away both the piano and Latin percussion. "Limelight": Lovely piano background melody welcomes you to the wonderland full of sparkling flog-shaped temple blocks and bells. "My Favorite Things": Uneasy and dazzling note. Glamorous fantasy. "Chro-chan? ": Non-stop, ultrafast chromatic virtuoso. TANAKANDA's original number. "Sunny": Brisk and pleasant down beat for adults. "Bolero with P and M": Asian jazz that leads you to an emotional climax. Based on the original piece "Bolero with S and M - for shamisen and marimba"
"Scarborough Fair": Like the sun before dawn: sunlight coming over the horizon. "A flight of a wild mosquito": A perfect synchronism of complex rhythm. Too cool, the striped mosquito. "A sheep's dance" from "The sheep's hair whorl": An arrangement of four movements from "The sheep's hair whorl - Hichiriki and percussion". Beating of the earth and exultation make you feel happy to be alive. (c)2005- Bon-Kan Project / Hurryken Co., Inc. all rights reserved.